London is home to some glorious green spaces including leafy squares, urban gardens and eight royal parks. And when the sun shines, there's no better place to eat than alfresco. We've got the lowdown on where to find London's best picnic spots and tips on where to shop for quality ingredients to put together your very own outdoor feast. Where to picnic: There are plenty of snacking spots in Regent's Park, a 410-acre former hunting ground of Henry VIII. Shoot the breeze by the boating lake, pick a fragrant patch by Queen Mary's Gardens, home to 30,000 roses or find a secluded spot by St John's Lodge, a private residence with a small public garden that can only be accessed by a hidden gate. Where to shop for food: Head to nearby Marylebone High Street to pick up artisan cheese from La Fromagerie, Scotch eggs and meat pies from the Ginger Pig and tasty pastries from Patisserie Des Reves. If you're picnicking on a Sunday, make your way to the Marylebone Farmer's Market to stock up fresh juices from Chegworth Valley and freshly baked bread from the Old Post Office Bakery. Where to picnic: On the north side of Regent's Park, leafy Primrose Hill offers fantastic views of the London skyline from its summit which is more than 60 meters above sea level. Head up to the protected viewpoint and take in London landmarks including the London Eye, the Shard and the BT Tower. The park is a popular spot for picnics, kite-flying and celeb spotting (local celebrity residents include Jamie Oliver and Cara Delevingne). Where to shop for food: If you're heading to Primrose Hill from the Camden/Chalk Farm area, swing by Shepherd Foods on Regent's Park Road, an independent family-run grocery store. This posh deli stocks all the key picnic items like fresh bread, cheese, meats and booze. There's also an impressive American snack section where you can stock up on things like graham crackers and Snyders pretzels. You could also consider grabbing a dish from one of the many food stalls at Camden Market however you'd be wise to buy something cold as you'll be walking for at least 15 minutes. For budget buys head to the large Morrisons Supermarket on Chalk Farm Road. Where to picnic: Bordered by Mayfair, Knightsbridge and Notting Hill, it's no surprise that Hyde Park is one of London's busiest parks. When the sun shines, you'll see Londoners taking part in all manner of summertime pursuits including inline skating and swimming in the Serpentine Lido. The park is spread over 350 acres so it's easy to find a patch of grass on which to picnic although you can expect large crowds on warm, sunny days. Some of the prettiest spots include the Rose Garden in the south east corner of the park, the Italian Garden near Bayswater and the Diana Memorial Fountain by the Serpentine Lake, a great option if you're picnicking with young kids. Where to shop for food: Your food options will likely be determined by the gate you use to enter Hyde Park. On the Knightsbridge side you could pick up gourmet treats at Harrods food hall or some Lebanese deli dishes at Noura. In Kensington the Whole Foods store on Kensington High Street covers all picnic bases and in Bayswater you can pick up sandwiches, pies and cheese and meat platters at the Bathurst Deli. Where to picnic: It may be small but St James's Park is perfectly formed. Sandwiched between Buckingham Palace and the Horse Guards Parade, this regal garden is home to a pretty lake where pelicans roam free. Throw a blanket down on either side of the lake or rent a deck chair for a few hours. Where to shop for food: For a luxury treat, Dukes Hotel can arrange for a butler to deliver a bottle of champagne and a picnic hamper packed full of British produce like Loch Duart salmon, cheeses and chutney, straight to your blanket in the park. Or you could put together your own spread from Sourced Market on Buckingham Palace Road. The grocery store is modeled on a farmer's market and stocks seasonal food (bread, cheese, meats, beer) from independent producers across Britain. Where to picnic: Work up an appetite with a pre-picnic stroll up to the top of the park to take in the stunning views of the London skyline. From the Royal Observatory you can peer over Canary Wharf, the river Thames and the iconic O2 centre. Drop back down the grass verge a little and throw down a blanket to make the most of the London vistas. 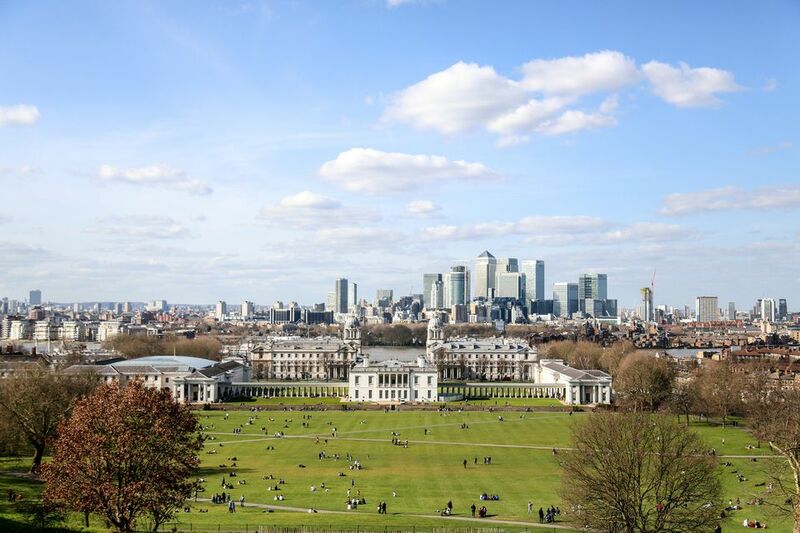 On your way back down, take a walk around the National Maritime Museum and the Old Royal Naval College, both part of the Greenwich Maritime World Heritage Site. For a quieter spot consider heading to the pretty Rose Garden on the eastern side of the park. The roses are in full bloom in June and July. Where to shop for food: Greenwich Market features an impressive array of food stalls from which you can stock up on picnic produce. Highlights include homemade dim sum from La-Mian, vegan cakes from Rubys of London and southern sandwiches from Pig Dogs and Brisket. For traditional sandwiches and drinks there's an M&S Simply Food store at Cutty Sark Station. After picnicking and taking in the views, finish the day with a pint at the Old Brewery, a craft beer pub with a huge outdoor terrace.